A day aboard The Liberté is a great day of summer fun, but did you know it can also have benefits for your health as well? A day aboard The Liberté is a great day of summer fun, but did you know it can also have benefits for your health as well? In general, a day spent on the water can be an excellent boost for your health. Why not give it a try? 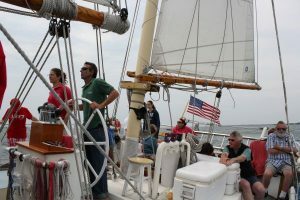 Spend a warm summer day enjoying all that a day on the water has to offer, and relax aboard The Liberté as you sail the waters of Cape Cod. After staring at our computer screens and phone screens throughout the week, we often need to recharge our minds with quality time spent outside. The sight of the ocean that will surround you as you enjoy a sail on The Liberté is a perfect fix for a clouded mind. Take a break from the stress following a long week of work with a day sail and enjoy the beautiful scenery on the waters around Cape Cod. With this, the calming sight of the water alone may also allow you to experience reduced anxiety and lower stress levels from your week. What better remedy for writer’s block than a relaxing day spent on the water? For all artists alike, the sight of the blue water, as well as a memorable adventure, can also help to inspire advancement in your creative pursuits. Whether your experiences encourage you to write or one of your photos becomes your next painting, inspiration surrounds you on your sail. Take a mini-vacation from any stressful tasks that you have been primarily focused on and allow an experience on the water to hit the refresh button on your creativity. Not only is water great for individual relaxation and growth, but it is also great for sharing special memories with family and friends. On The Liberté, you can enjoy gatherings with your family and friends for a day of fun or any special occasion. From romantic weddings to fun family reunions, the water is the perfect place to share a great time. This entry was posted on Friday, July 27th, 2018 at 11:51 am. Both comments and pings are currently closed.